This contains the Design files (schematic, PCB layout) for the shield and the Arduino software libraries. One of the people that purchased some of the shields has adapted the library to run on a Raspberry PI. I may include that library at some point in time. goToRGBHI() uses 1024 CIE lab brightness corrected values (vs. 256 for goToRGB) for smoother fading at low values and when fading slowly. goToHSB10() provides much improved HSB accuracy. goToHSB() uses 256 values for Hue, which depending on fading speed can result in visible steps. The new routine uses 768 values and provides much smoother fading. 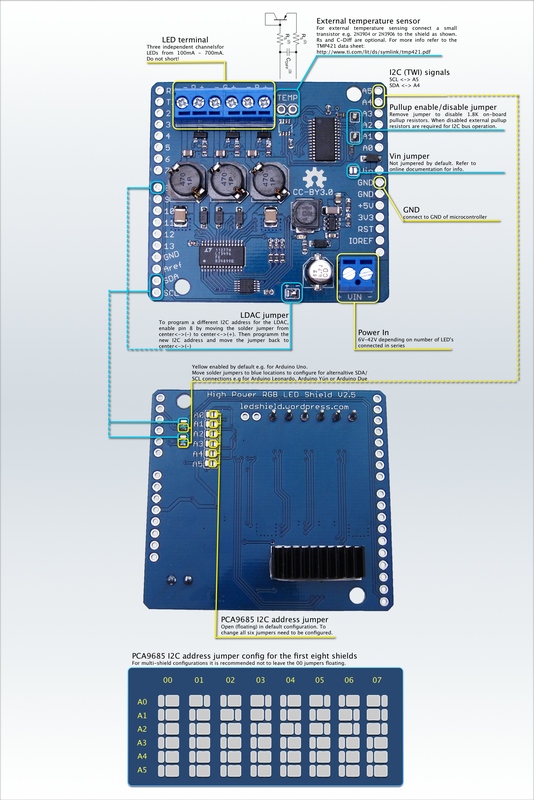 The SoftI2CMaster library, which is needed in order to change the I2C address of the MCP4728 LDAC, contained an error, which resulted in the sketch not being able to read back the correctly programmed I2C address and made it appear like the address programming failed. A big Thanks! to Mark_H who posted a comment about this here on the blog. Finally I was able to put the shield up for sale at Tindie. If there are any questions in respect to volume discounts or shipping rates please contact me be before buying by posting the question to the the STORE section of thIs blog. I still have some work to do on the library before I will commit it to GitHub but the shield will work fine with the library for the V2 of the shield. As I’ve mentioned before in my own projects I’ve never used the temperature sensor. When redesigning the shield I decided to move the temperature sensor from its proximity to the LT3496 LED driver chip to the edge of the board in order to free up some surface close to the LT3496 for better cooling. 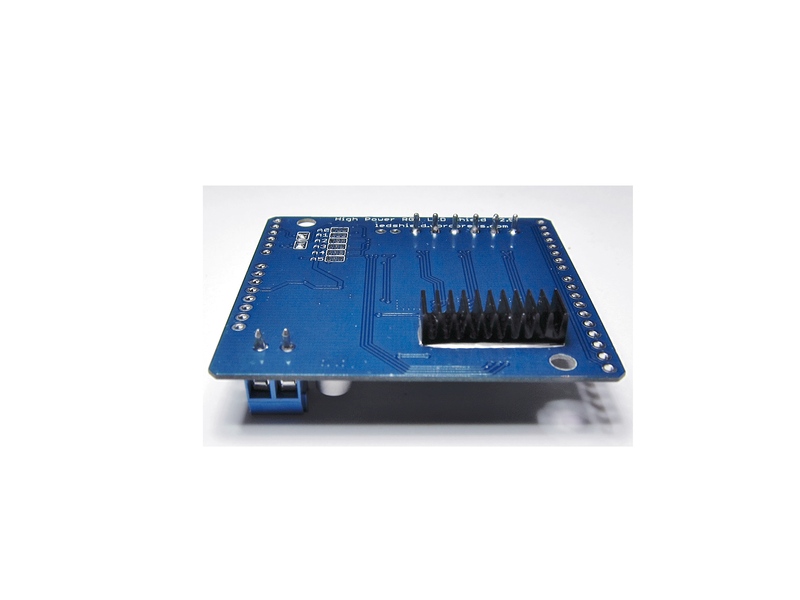 The TMP421 temperature sensor has one on-die temperature sensor and one for remote temperature sensing by means of a cheap small-signal transistor. In the previous shields the on-die temperature sensor helped measuring or rather estimating the LT3496 temperature. Now that the TMP421 is moved to a different location on the shield far away from the LT3496 it still measures a temperature but it’s rather ambient temperature. 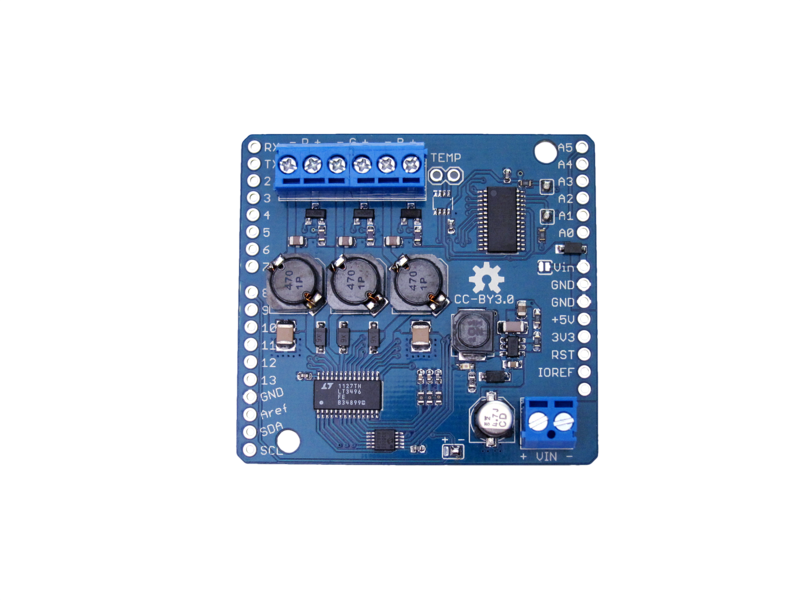 While the LT3496 and the MCP4728 have configurable I2C addresses the TMP421 in the current version 2.5 shield only has one fixed I2C address. 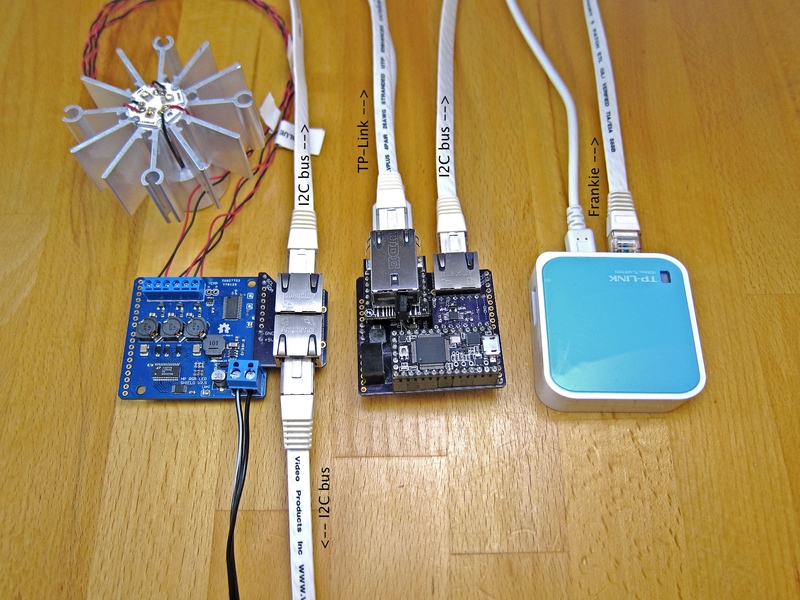 That means only one temperature sensor can be addressed on one I2C bus. However, if for example you have 2 or more shields on the same I2C bus and all of those shields are populated with the temperature sensor the PWM and analog dimming functions will still work. Only the temperature sensor functions cannot be used in that case. In a previous post I mentioned that all chips with the exception of the temperature sensor are FM+ components and can be operated at I2C bus frequencies of up to 1MHz. The data sheet states in the SERIAL INTERFACE section that the chip can actually be operated up to 3.4 MHz. Finally after what seems like an eternity I was able to make a small series of 32 boards over the thanksgiving holidays. All of the first run of boards do not have the Temperature Sensor or the Heatsink. However, both of these can be added relatively easy. While I will ultimately will sell these on Tindi.com, however realistically this will be early next year. Of these 32 boards only 9 are still available. I may add another batch of 8 soon if supplies run short. That’s all I can make in an evening after work. Over the Christmas Holidays I am hoping to make another 40-50. Also, after all the blog of the original creator of these previous versions of this shield – neuroelec – seems to have gone offline. So over the next few weeks I’ll also be updating the instructions. Yesterday I received the 100 boards I ordered from Hackvana.com. It’s a surprisingly small packet, mainly due to the fact that with 0.8mm these boards (for thermal performance reasons) are only half as thick as standard boards. The different thickness also did not cost any extra, it was actually a little less expensive. Most services I had checked before actually charge more for non-standard thicknesses. Below is a photo of one of these. I focussed my point-&-shoot camera on a more intricate part of the board. Due to the shallow depth-of-field much else is rather unsharp, but enough can be seen to say that these are doggone gorgeous! And, Yes, it’s been just two weeks since I ordered these. That’s pretty speedy if taking into account that these boards come from Shenzen/China! On the other hand, due to the number of boards I chose DHL and not China-, or Hong Kong post. A while ago I had done some more research on possible PCB manufacturing. Not the full assembly just the bare board. The difficulty was finding a source that had acceptable prices but at least offered 2oz copper. Now I’ve placed an order of 100 pcs with hackvana.com after having a very fruitful email conversation and an IRC chat with Mitch who runs Hackvana. 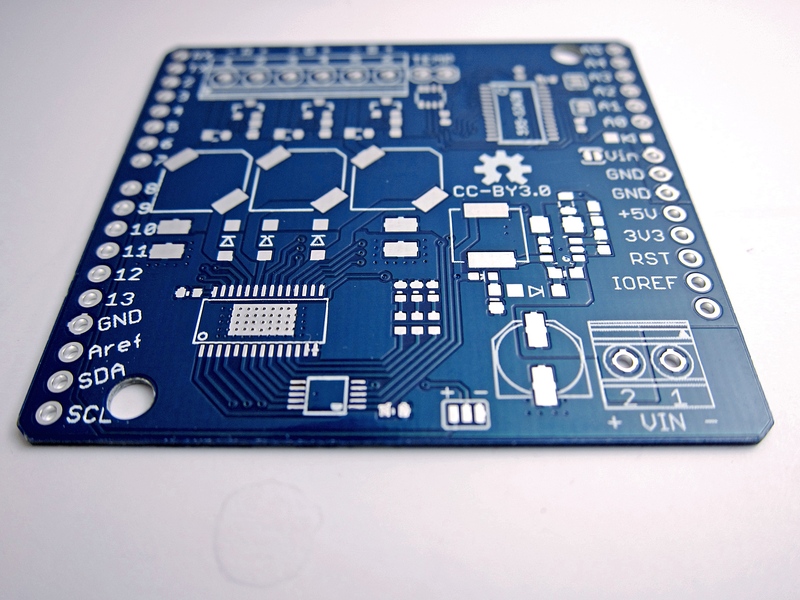 Ive read some very good reviews of the quality of these boards and am looking forward to receiving them. I will likely take 2-3 weeks as the actual manufacturing happens in Hong Kong. After a discussion with Mitch who runs Hackvana.com I decided not to get the immersion gold finish (ENIG) . Yes, it looks great on a bare board but on a populated board with tented vias there is nothing left visible of the gold plating. The real purpose for the ENIG finish is to have e very flat surface and a longer shelf life. The flatness of the boards will be fine for the intended purpose with the RoHS finish – no BGA chips in the design – and I don’t intend to have the bare board laying around for more than 3 months. I also chose the 0.8mm thickness for better thermal performance as described in an earlier post. In fact and quite to my surprise, this was actually a little cheaper so there was no reason not do do it. I’ll post some pictures of the boards as soon as they have arrived.! It’s been a while since the last update and unfortunately not much has happened in terms of getting the Tindie Fundraiser started. Not only our private and professional lives have kept us very busy but our initial idea to have the shield manufactured by a Company in Germany is associated with complications that have nothing to do with the LED shield itself but are rather of logistical, and possibly financial nature. For business insurance reasons the small company is not able to conduct business with a private person in the US. I’ve looked into registering a business and will eventually do that, but that is rather a long term goal and may not happen within the next two months. Given that Tindie is a US website, pledges on a project would be trickling in in $US and once successfully funded we’d have to transfer funds per PayPal to Germany and into Euros. Then my partner would have to ship most of the assembled boards back into the US through customs. For a single shield customs would unlikely a problem, however, for a larger number one needs to make sure these are declared properly and customs fees have to be paid. Wile I have done some research it is unlikely that there would be FCC implications, these are all consideration that in the end will somehow result in additional cost and may render the project unfeasible. Long story short, I’ve found two sources for low volume PCB manufacturers that offer PCBs with 2oz copper plating and have requested quotes. I have also found a company that can assemble the boards. While they don’t provide turnkey including sourcing the parts, the price that was provided in the initial contact is very attractive. While we have not spoken about details I am hoping to have more information by the end of this week. Another area of concern is that I’ve never tested these shields under the full load of 40W. Buying enough LEDs, heat sinks would of course work but is rather inflexible. 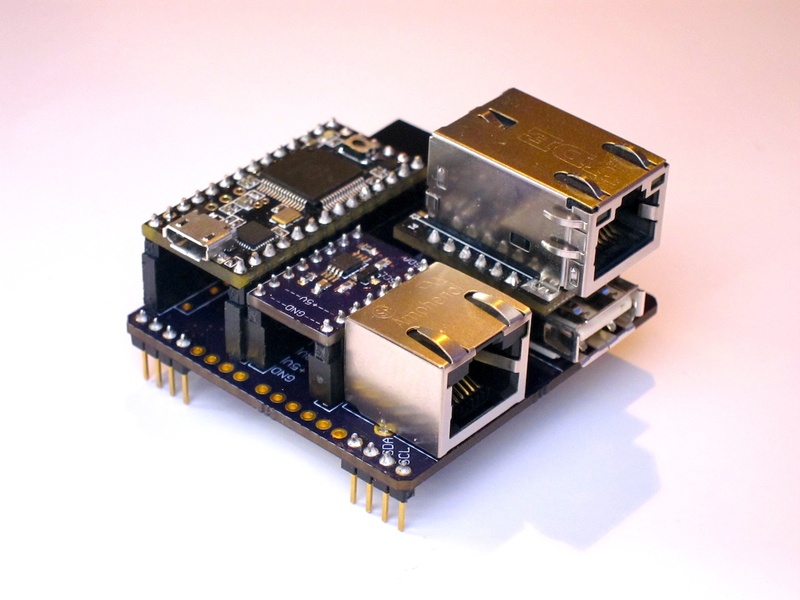 But I’ve found a product on Tindie that fits the bill perfectly, the Re:load 2, an adjustable Dummy Load. I’ve ordered three of those and will test one of my prototype LED shields as soon as they arrive. Once all the above has settled to my satisfaction I will start the Fundraiser. LED lighting supplierI prefer Cree LED chips. They are high lumens. Most of our LED lights is made with Cree LED chip. AIS LEDThanks,How Can I get the dimming LED driver? We are an LED lighting manufacturer. LightThanks,LED shield. You LED PCB looks nice.